Here are "the greatest opera stars on one double album for the first time ever," as the booklet cover breathlessly informs us. 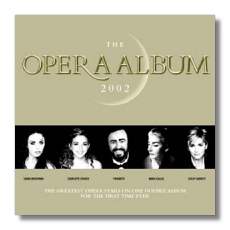 In yet another attempt to bring opera to the masses, EMI Classics has collected thirty-seven arias, duets, and choruses from its back catalog and packaged them with cover photographs of Roberto Alagna, Maria Callas, Luciano Pavarotti, Angela Gheorghiu, and Placido Domingo. Although this collection has the look of a "make a quick buck" project – and it probably is – The Opera Album is suited to short car trips. Pick up your dry cleaning to Delibes and your Chinese food to Cilèa. I've been collecting opera recordings for about thirty years, but obviously I haven't heard all of them, and I was grateful for the opportunity to hear (for example) Nicolai Gedda and Ernest Blanc in the famous Pearl Fishers duet and Montserrat Caballé's "Un bel dì." If, however, the market for this collection really is the new or casual collector, he or she should be aware that the booklet omits boring, useless information as sung texts, translations, and even synopses about what is being sung. (Instead, there's a short and puffy blurb inviting us to "relax and enjoy two and a half hours of the world's most popular opera arias, performed by the elite of the opera world." The word "glamour" appears twice.) So, if you don't know what the "elite of the opera world" actually are singing about when you pop these discs in your CD player, you will not be more enlightened two and a half hours later. Thus, opera is reduced to a series of pretty, dramatic, and "glamorous" noises – what they mean appears to be relatively unimportant. I am not displeased about the chosen repertoire, although Italian operas dominate. There is no Donizetti, however, and only one taste of Wagner. Furthermore, Gounod's Faust is not represented. This would have been unthinkable fifty years ago! Furthermore, I have no serious complaints about the singers who have been matched to the repertoire; there's not a bad performance on this pair of CDs. Pavarotti, only marginally an EMI Classics artist, squeaks in by virtue of the L'Amico Fritz recording he made in the late 1960s; the inclusion of his "Ingemisco" from Verdi's Requiem is cheating, because that's not an opera! I am going to mention several EMI Classics artists who are curiously absent from this CD: Giuseppe di Stefano, Janet Baker, Alfredo Kraus and Carlo Bergonzi. No disrespect is meant to Alagna and Gheorghiu, but it's a sign of the times when they eclipse Franco Corelli and Renata Scotto. Also, I think it was a miscalculation to include "Casta Diva" from Callas's second complete recording of Norma. I suppose this was done to avoid the inclusion of another monaural track. The Opera Album fills no need, but it's pleasant enough when you're looking for opera but not a commitment!